Years ago, Earth and Titan fought a war and Earth lost. The planet was irradiated and most of the surviving population is sterile. The few survivors play an intricate and unending game called Bluff at the behest of the sluglike aliens who rule the planet. At stake in the game are two very important commodities: land and spouses. Pete Garden just lost his wife and Berkeley, California, but he has a… plan to win them back. That is, if he isnt derailed by aliens, psychic traitors, or his new wife. 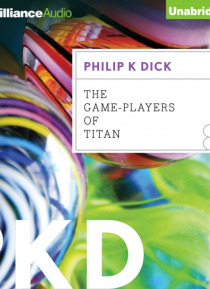 The Game-Players of Titan is both satire and adventure, examining the ties that bind people together and the maddening peccadilloes of bureaucracy, whether the bureaucrats are humans or aliens.